Summer fun craft — jetboats and personal watercraft — were big sellers during the third quarter. Summer fun craft — jetboats and personal watercraft — were big sellers during the third quarter as the recreational boating industry sold 10.5 percent more boats than it did the previous year. The industry sold 66,623 boats during the quarter, up from 60,276 a year earlier, Statistical Surveys reported today. Small to midsize fiberglass outboards and the aluminum fishing boat and pontoon boat segments scored strong single-digit gains, leading the industry’s main powerboat segments to 6.8 percent sales growth. The figures are for 44 states that represent 89 percent of the U.S. market, excluding only Illinois, Maryland, Georgia and Louisiana, and two states — Maine and Hawaii — that report sales annually in the early part of the year. Statistical Surveys sales director Ryan Kloppe saw no surprises among the upbeat quarterly data, which he said confirm forecasts that sales could rise as much as 8 percent industrywide this year. Sales data on documented vessels were incomplete because of a computer conversion that caused a data entry delay at the Coast Guard. That created an incomplete report for boats larger than 31 feet and understated the lower-volume cruiser and yacht markets. More PWC were sold during the quarter than any other category of watercraft — 20,087 — as consumers bought 3,877 more of them than they did during last year’s quarter. PWC sales total 50,185 on a 12-month rolling basis for the period through September in the 44 states the report covers. Jetboat sales gains were higher on a percentage basis, rising 30.8 percent, compared with 23.9 percent for PWC. There were 1,367 jetboats sold during the quarter, up 322 from 1,045 the previous year. Sales of aluminum fishing boats and pontoons and small to medium-size fiberglass outboards topped the main segments, as they consistently have during the industry’s long recovery from the Great Recession. 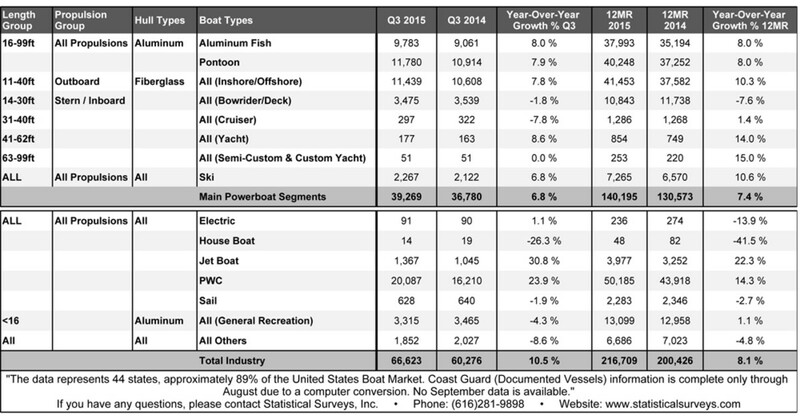 Pontoon sales rose 7.9 percent to 11,780 boats, sales of fishing boats climbed 8 percent to 9,783 and sales of fiberglass outboards gained 7.8 percent to 11,439. Sales of pontoons and fiberglass outboards exceed 40,000 for the 12-month period through September in the 44 states. Ski-boat sales rose 6.8 percent to 2,267, but sales of 14- to 30-foot inboard and sterndrive boats fell 1.8 percent to 3,475, although results in that segment were improved from previous reports. Kloppe said sterndrive sales have been gaining and he was encouraged that they nearly broke even with the pace of the prior year’s quarter. “Let’s hope that’s a turning point for the sterndrive category,” he said. Data available for the smaller-volume categories of larger boats showed a decline of 7.8 percent in sales of 31- to 40-foot cruisers, or 25 boats, to 297; a gain of 8.6 percent in sales of 41- to 62-foot yachts, or 14 boats, to 177; and flat sales of 51 units among 63- to 99-foot custom and semicustom yachts. Sailboat sales fell 1.9 percent to 628.